The Holiday Inn Express Hazard, KY Hotel & Suites welcomes you to the&regQueen City of the Mountains&reg, Hazard, KY. Our staff will make you feel like you are home with our outstanding service and Southern hospitality. Our hotel is conveniently located 1 mile NW from the intersection of Route 80 & Route 15 on Route 15. 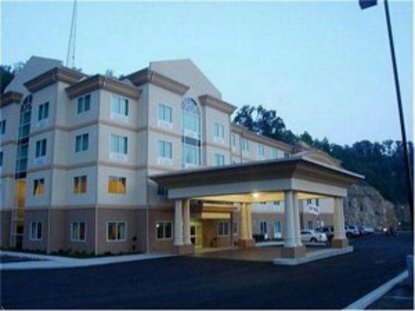 Traveling for business or on vacation&reg Stay Smart Our hotel is located in the heart of the Appalachian Mountains. Fishing, hunting or hiking &reg we are your ideal location. We are also located near Mammoth Onyx Cave, Buckhorn Lake State Park, Carr Creek Lake, Kingdom Come State Park and the Black Gold Festival. Free high-speed Internet access is available in every room. Start your day out right with our complimentary piping hot Smart Start breakfast - served daily Unwind by taking a swim in our indoor pool or keep up with your fitness routine in our on-site fitness center. Area restaurants and shopping are with in easy walking distance. We are also conveniently located to the Hazard Community and Technical College and the Hazard ARH Regional Medical Center. We look forward to exceeding your expectations This hotel is committed to providing accessible facilities under the American Disabilities Act. If your accessibility needs are not met, please contact the Hotel Manager on Duty. Should you require additional information regarding accessible facilities for guests with disabilities, please call 1-800-Holiday (U.S. and Canada) or contact the hotel directly. For the hearing impaired, TDD service is available at 1-800-238-5544 within the U.S. and Canada.